In the space of storing, managing and protecting data, different approaches for handling information are used. The advent of cloud has brought in compelling benefits, but the amount of data that organizations continue to store is growing exponentially, resulting in mostly unrelated solutions that have lead to the rise of Hybrid IT. On the Data Protection side, Businesses increasingly demand 100% uptime with no data loss, or what IDC refers to as the "new race to zero" – 0 RPO and 0 RTO. Such scenarios are still unrealistic for all but the most expensive and demanding applications that can afford fully redundant systems. IT organizations are improving the performance of their storage stacks and gradually driving down their RPO and RTO. Unfortunately, in most cases, this requires a complex strategy of interrelated components, which are often vendor and platform-specific, leaving IT to manually manage multiple systems and increasing the overall complexity of their environments. The technology advances presented in this session were recently recognized by Frost & Sullivan with the award for Technology Innovation for Data Storage and Management. Join us for a 360 view from our Industry Expert, Jacob Cherian, VP of Product Strategy at Reduxio and previously Dell Inventor of the Year, as well as a Fireside chat with a Keith Worthington, IT Manager at LineMaster of the technology being presented. A short guide on how to manage a datastore using the Reduxio StorApp for VMWare vSphere V2.0. A quick guide on how to protect virtual machines or a datastore using Quiescence policy in the Reduxio StorApp for VMWare vSphere v2.0. During the last few months, ransomware has been a real, dangerous and costly threat to governmental institutions. The example of the city of Atlanta is one of the most dramatic examples not only on both staff and internal working environment but also on the day-to-day life of all citizens. So what can be done to ensure business continuity? What are the keys to avoiding downtime and critical data loss? Whom do they concern? Malware-as-a-service has become a real industry and let’s face it, zero risk doesn’t exist. It's no longer a matter of if your organization will be attacked, but when and its origin. The point is to not only get your IT department ready in case of a malware disaster but also to incorporate the entire company into keeping the door shut against any elements threatening the integrity of your data ecosystem. Cybersecurity expert, John Bambenek and Reduxio Director of Customer Support, Eli Lopez will cover real-life solutions and industry tips and tricks to optimize your entire IT ecosystem against the rise of malware-as-a-service. A short guide to recover a datastore for VMWare vSphere V2.0 using BackDating in the Reduxio StorApp. A short guide on how to recover a virtual machine for VMWare VSphere V2.0 using BackDating in the Reduxio StorApp. Get into the Life of an I/O inside the Reduxio TimeOS™. Discover an innovative technology that is changing the way enterprises store, manage and protect data storage. Get behind the scenes to find out how this technology is able to converge previously isolated primary and secondary storage into a single data management platform. Consolidating global in-memory data reduction, active tiering, instant DR, CDM & advanced mobility. Want to learn from your peers and have real valuable feedback on IT Management and Goals? Join this peer-to-peer webcast! Join us for live Q&A and discussion with fellow IT professionals! Michael Johnson describes how his team has always been a cost center for the company and he managed to transform it into a productive, revenue generating team. In this video, he talks about the challenges he faced and how the Reduxio system helped him resolving those challenges. He has over 25 years experience in business and information systems project management with the focus on the implementation of technology-based products, systems, and services on time within budget. A webinar on how companies can ensure that their data protection environment meets desired RPO and RTO in a cost-effective way as well as how to achieve optimal data recovery goals. - Issues that affect RPO and RTO, such as network, change rate, target speed and technology choices. - Verifying data recovery and disaster environments. - Converging your primary and secondary storage to reduce complexity and achieve near-zero RPO/RTO’s. Watch this webinar to learn everything there is to know about Benchmarking Applications workloads, allowing great performing solutions to save time and money. Investing in Enterprise Storage is an important decision of any IT department. There are meaningful differences in how storage products perform according to the applications you are running. Unfortunately, using the publicly available information to compare one storage product to the next can be frustrating and this lack of comparable performance testing data can result in unpleasant performance problems that you’ll have to deal with in the future. How to recover a deleted database using Reduxio’s BackDating technology. Reduxio's BackDating™ allows you to recover from a ransomware attack with a second level granularity. Meaning you can restore data from right before the second the attack happened. So you lose minimal data and more importantly it is remarkably fast to recover irrespective of the time. Be it to a point 30 seconds earlier or 30 hours earlier, the recovery time is the same. With Reduxio, you don't have to worry about Ransomware, you can sit back & relax. This content was created by Idit Michael who has over 10 years of experience in infrastructure implementation, managing operational teams, leading and accompanying technological projects in large organizations. This webcast demonstrates how to recover a deleted VM (virtual machine) using Reduxio’s BackDating technology by Eyal Traitel, Director of Technical Marketing. - BackDating™ allows you to revert or clone to any second in the past within seconds. - See in real-time, how BackDating instantly recovers your data with a second level granularity. - Near-zero RTO/RPO supports data recovery and application testing use cases. BackDating™ acts as a time machine for your data. Clone any volume to any point in time in the history of the system, for data recovery or application testing purposes. Holland Barry, Chief Technology Officer & Shane Thorson, Principal Architect. Interview with our customers at Catbird: Holland Barry, Chief Technology Officer, and Shane Thorson, Principal Architect. 4. How long has Catbird been using OpenStack and Reduxio's Cinder driver? 5. What are the other benefits of using Reduxio? 6. Anything else you want to add before we open for questions? 8. What is the data size on which you are performing recovery? 9. How did Reduxio help you overcome your challenges? 10. Was the UI your primary interface or did you use command line? In this video, listen to Michael Miers, Chief Information Officer at Anna Maria College as he shares his experience with Reduxio. And how he and his team benefitted from the solution that helped transform his IT infrastructure. With over 15 years of experience in IT and a proven track record of success in many aspects of higher education. Michael is charged with overseeing the Information Technology Department and to maintain the security and integrity of college data, manage all IT budgets, organizing all computer application training, guide long-range technology planning, represent the college on all issues of technology, oversee and implement new technologies to keep the college current and competitive with other institutions. The number of Ransomware attacks on businesses tripled since last year. It’s the trending topic on cyber-security right now, and over 4000 attacks happen every day, the total ransom amounts close to $1Bn and it’s getting worse. Attacks are becoming increasingly sophisticated, and VM’s are no longer safe. So, should you be worried? We think not. John has been engaged in security for 15 years researching security threats. He is a published author of several articles, book chapters, and one book. Michael Martell, 30-year experience in IT infrastructure. Systems Manager at Dingley Press, the largest catalog printers in the US . Before Dingley, Michael led IT infrastructure & operations at Blue Cross and Blue Shield. A session designed to explore the past, present, and future for data protection in a VMWare environment. Traditionally, enterprises have implemented a complex, siloed backup architecture with disk hardware and tapes to reduce costs for server backup. Unfortunately, these legacy multi-tiered solutions add more complexity, limit scalability, and dramatically increase storage costs. And as data continues to sprawl out of control, infrastructure silos are expanding to unmanageable footprints. You can find interesting and useful resources on VM BackUp at https://beyondtheblocks.reduxio.com"
Unify your data storage and backup, simplify data management. 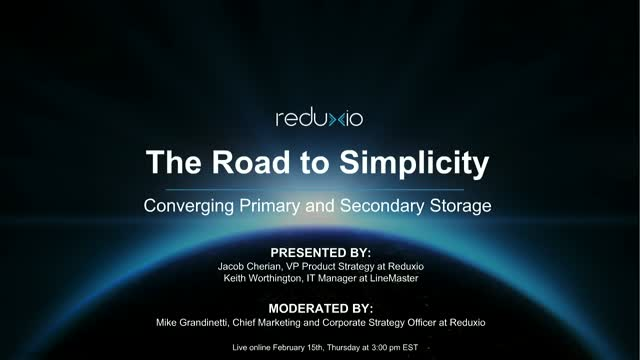 Founded In 2012 by a group of storage industry veterans, Reduxio is redefining data management and protection with the world’s first unified primary and secondary storage platform. Powered by the patented TimeOS storage operating system, Reduxio provides breakthrough storage efficiency and performance along with the unique ability to recover data to any second. This capability far exceeds anything available on the market today. Reduxio's unified storage platform is also designed to deliver near-zero RPO and RTO as a feature of its storage system, while significantly simplifying the data protection process. It also delivers built-in data replication for disaster recovery. This channel is designed to support the exchange of ideas and collaboration in the IT community for unifying primary and secondary storage. Find unique webinars, step-by-step video guides, customer reviews, and more. To learn more about Reduxio, visit www.reduxio.com.